Sabita and Sima sometimes seem like Siamese twins, living parallel lives, acting out the same story. Both sport the same boy haircuts typical for young Nepali girls, and both invariably giggle between every sentence. Sima, 11, likes to eat oranges and study social studies, while Sabita, 10, likes mangoes and English. They both like to play volleyball. Even if you didn’t know their backgrounds, or perhaps even if you did, you might think they were sisters. Sima lived out the classic child labor narrative. Following her father’s death, her mother, unable to support four children, sent Sima, then 9 years old, to the city with expectations that she could earn some money and attend school. These were false expectations, indeed, for Sima never visited a classroom. Instead, at the mercy of a house owner, Sima spent twelve to thirteen hours a day performing domestic labor. She cleaned the house, washed dishes, did laundry, cooked meals, tended to the kitchen garden and collected cow dung for use as fertilizer. Exhausted at night, attending school was an elusive dream. Enter BASE. In the spring of 2009, BASE conducted a series of child labor raid and rescue missions that, in conjunction with other anti-child labor initiatives, rescued more than 1,000 children in a two-year period. Sabita and Sima’s parallel lives converged as they were rescued and taken to a BASE rehabilitation center where they received initial care and support. Sabita was later taken back to her home, but with her father dead, mother run away with another man, and brother burdened with financial problems, she decided to return to BASE’s care. Both girls ultimately embraced their newfound freedom by demanding the rights of children as participants in the BASE-organized Nepal March for Education, part of the Global March Against Child Labor. Sabita and Sima now live at the Children’s Peace Home, a charitable initiative providing care to underprivileged children, and ride a school bus everyday to the Hindu Vidyapeeth School, a prestigious boarding school. With their lives interwoven, they share many things—a penchant for studying, compassion for their friends and the joy of youth. Above all though, they share the same strength and resilience—and hopefully, because of BASE’s intervention, the same bright future. The story above was compiled from two interviews with Sabita and Sima, one at the Hindu Vidyapeeth School and the other at the Children’s Peace Home, as well as the documentary, The Price of Childhood, by Kan Yan, 2009 Advocacy Project Peace Fellow with BASE. 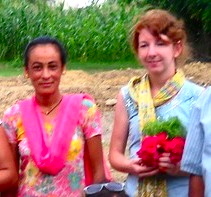 Please see Kan’s blog for a more detailed account of Sabita’s story.